I have been staring at this recipe and others like it for a week now, so I hope you try it and like the wonderful combination of berries and crunchy nuts! We can still find fresh berries at our markets, so enjoy them while they last! Check older posts here or our webpage for more berry tips and ways to preserve them all year round. 1. Preheat oven to 400°F for muffins, mini loaves and mini Bundts or 375°F for a large loaf. (See pan options, above.) Coat pan(s) with cooking spray. 2. Whisk whole-wheat flour, all-purpose flour, baking powder, cinnamon, baking soda and salt in a large bowl. 3. Whisk eggs, buttermilk, brown sugar, butter, oil, vanilla and almond extract in another large bowl until well combined. 4. Make a well in the center of the dry ingredients, pour in the wet ingredients and stir until just combined. Add berries and almonds. Stir just to combine; do not overmix. Transfer batter to the prepared pan(s). Top with additional almonds, if desired. 5. Bake until golden brown and a wooden skewer inserted into the center comes out clean, 22 to 25 minutes for muffins or mini Bundts, 35 minutes for mini loaves, 1 hour 10 minutes for a large loaf. Let cool in the pan(s) for 10 minutes, then turn out onto a wire rack. Let muffins and mini Bundts cool for 5 minutes more, mini loaves for 30 minutes, large loaves for 40 minutes. Some secret tips for a more successful bread baking! · Note: Whole-wheat pastry flour is milled from soft wheat. It contains less gluten than regular whole-wheat flour and helps ensure a tender result in delicate baked goods while providing the nutritional benefits of whole grains. Find it in the baking section of the supermarket or online at King Arthur Flour, (800) 827-6836, bakerscatalogue.com. · Tips: No buttermilk? Mix 1 tablespoon lemon juice into 1 cup milk. · To toast sliced almonds: cook in a small dry skillet over medium-low heat, stirring constantly, until fragrant and lightly browned, 2 to 4 minutes. Do you need a break to refocus and re-energize!? What's better - brown-baggin it or trusting the office cook? Lunch is a crucial meal in your day. By that afternoon break, out bodies are often telling us to use the hour for a nap or to quick grab a fast food fix. 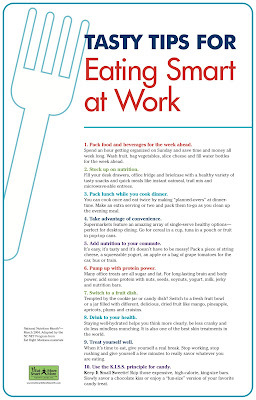 But, your body will need more nutrients and energy to keep going for second half of your day. I am not selling 5 Hour Energy drinks to get you through your day, I'm selling a healthy diet and easy ways to make it happen in your work. The best way to have a healthy lunch is to make it yourself. A homemade meal is likely to be less processed and easier on your pocketbook. But it doesn't have to be hard to do. You can take advantage of convenient single serving packages, or create your own at home with small baggies. You can even prepare your lunch while you are cooking dinner! Cook extra and save a serving or two for later on. Left Overs have NEVER been lame. Try packing yourself dried fruits like apricots, mangoes or cranberries as a cookie alternative. While fruits are in season, enjoy! Everyone in the office will be jealous of those ripe tasty strawberries. 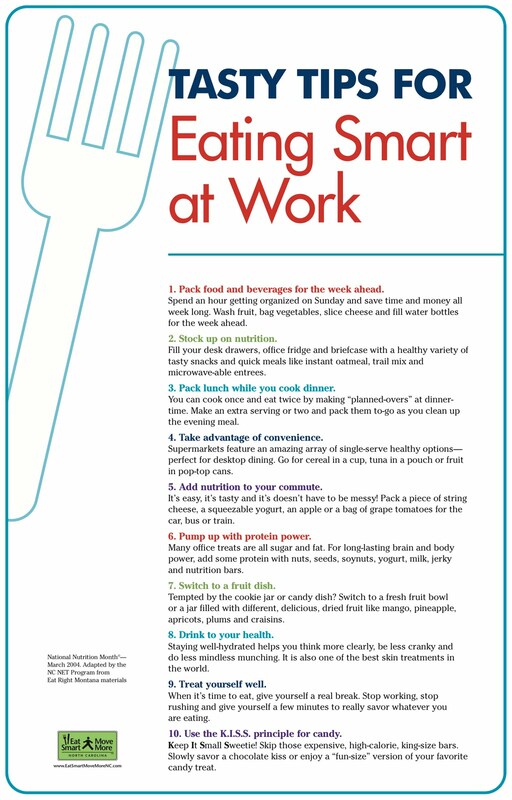 If you choose to buy your lunch at work, this is a great chance to experiment with different foods, and practice your nutritional smarts. Look for items with lots of vegetables, fruits and whole grains. A lean turkey breast or lean beef are good sources of protein, but so are nuts, seeds and soy. Avoid friend foods or other dishes cooked in lots of oils. Ask for dressings or sauces on the side so you can control how much extra fat is added to your dish. Remember, stay hydrated! Drinking plenty of water during your day keeps you alert and less cranky. Plus a video about eating healthy away from home! See ya'll Friday for some berry treats! It has been a HOT week, but raspberries can help to keep you cool. Raspberries have bunches of fiber and can help lower cholesterol. Like the other berries we have been celebrating this month, they too have anthocyanins that provide antioxidant power. This week we have cold recipes for snacks that will help you keep healthy and chilled while the weather is warm. 2. Divide the mixture among freezer-pop molds, stopping about 1 inch from the top. Evenly divide chocolate chips among the molds. 3. Stir the chips into the raspberry mixture, stirring out any air pockets at the same time. Insert the sticks and freeze until completely firm, about 6 hours. 4. Dip the molds briefly in hot water before unmolding. 1. Bring the water to a boil in a large pot, and stir in the tea bags, raspberries, and sugar until the sugar has dissolved. Week two of our berry extravaganza celebrates the Blueberry! They're good for you in so many ways and are quite delicious. We don't often think of berries or fruits in our main courses with meats and pastas, so here are some ideas to help the blueberry get a place of honor on our dinner tables. Turn the turkey over and transfer the pan to the oven. Roast until the turkey is just cooked through and no longer pink in the middle, 15 to 20 minutes. Transfer the turkey to a plate and tent with foil to keep warm. Place the skillet over medium heat and add before cooking stirring constantly, until the shallots begin to brown, 30 seconds to 1 minute. Continue cooking, stirring occasionally and scraping up any brown bits, until the blueberries burst and release their juices and the mixture becomes thick and syrupy, 4 to 5 minutes. Slice the turkey and serve with the blueberry pan sauce. Place chicken in a skillet or saucepan and add enough water to cover; bring to a boil. Cover, reduce heat to low and simmer gently until cooked through and no longer pink in the middle, 10 to 12 minutes. Transfer the chicken to a cutting board to cool. Bring a large pot of water to a boil. Cook pasta until just tender, about 9 minutes or according to package directions. Drain. Place in a large bowl. Add and cook, stirring occasionally, until the feta begins to melt, 1 to 2 minutes. We understand that buying local or organic foods can get expensive. That’s why we are so excited that those with EBT (food share) cards, are now able to shop at our local farmers markets! Wood County Farmers Market (at Rapids Mall) follows Wausau and Stevens Point's lead and begins accepting EBT today! Users will simply need to go to the EBT/FoodShare table and swipe their card. You can decide how much you would like to use and unused dollars can always be returned to your card. To make your digital dollars easier to handle, you will receive wooden coins, each valuing $1. Take your coins to any stand displaying "EBT/FoodShare Accepted Here" and buy whatever fresh food catches your fancy. Distributors will be expecting this update and should understand how to use the new coin system. The tokens do not expire so can be held from week to week! If you have questions about how this will effect your shopping, send us your comments or post them here.